Three out of the 17 European bison that were reintroduced to the Southern Carpathians last May, have died over the last weeks. Rewilding Europe and WWF-Romania are now together with the National Veterinary Authority in Bucharest carefully studying what the reasons for this very sad news might be. –”We are expecting to receive the medical results from the National Veterinary Authority in Bucharest next week”, explains local rewilding Team Leader Adrian Hagatis. ”There has been suspicion that maybe an outbreak of a cattle disease called ”Blue tongue” is the reason for this, but we cannot confirm this at this point in time. This disease appeared among cattle in Romania a couple of months ago and might have spread to the bison. Blue tongue disease is not contagious between animals, but spreads through a mosquito bite. The veterinary tests carried out will establish whether this disease is really the culprit or not. All the other bison seem to be in stable condition and are not showing signs of weakness. We have put out a call to experts in Romania and abroad to form a working group, that can quickly identify the best solutions in order to make sure the herd survives this winter, so that we can release them finally into the wild next spring”. 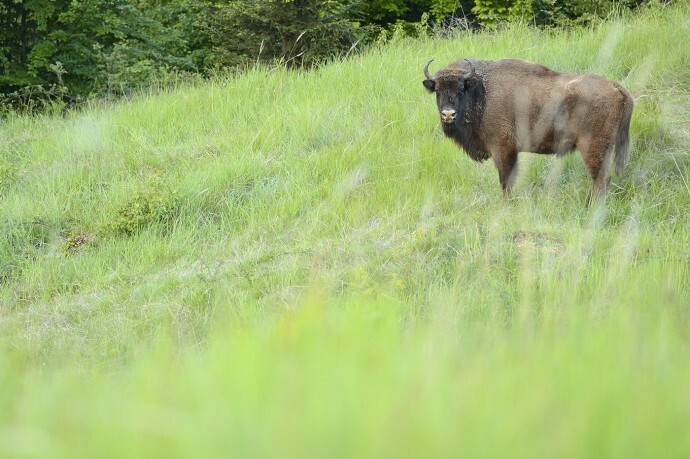 –”Bison have lived here for many thousands of years and are certainly able to do it again”, says Frans Schepers, Managing Director of Rewilding Europe. ”Surviving in the wild is not a walk in the park for any animal, and death and disease are natural processes, but this seems to be an unfortunate start of this new herd. Several bison projects across Europe have experienced different ups and downs, and we are using all the existing experience and most recent knowledge to ensure success. We are awaiting further fact-based results from the veterinary analysis, in order to decide on our further steps”. In May 2015 the plan is to finally release this current bison herd in the Tarcu area into the wild and also to bring in additional animals to strengthen the existing herd, all part of the continuous work to help build a long-term viable local population of about 500 bison here by 2024. A few weeks ago this bison herd was transferred from its 15 hectare acclimatization zone to a semi-wild area, ten times bigger. The area will now be closed for guided tours over the winter and the guided bison tours will resume first in spring 2015.